With warm temperatures approaching, it’s time to turn on the air conditioner. It’s important to preform maintenance on your unit to maintain peace of mind during the warm months ahead, save yourself time and money with efficiency and to avoid any inconvenient and costly repairs. There are different steps you will want to take to ensure the system is working properly and efficiently. First, clean around the system. Removing leaves, dirt, dust and debris allows the system to work free from constriction. You will want to check the refrigerant levels and the fan engine to make sure the fan blades are not damaged. Make sure your fan engine is not damaged or it may result in your unit working harder and costing you more money. If your fan blades show signs of wear, you may want to consider replacing them. Maintenance is key to the longevity of the unit. Taking small steps and doing simple maintenance may lead to the discovery of larger problems to come. If there are any major issues and the unit is beyond the point of repairs due to age and other conditions, we may recommend replacing the unit. Catching the problem early can ensure replacement before the hottest days of the year. HVAC Maintenance is important for many reasons. Peace of mind – Never worry about the air conditioning unit going out in the heat of the summer. Not all problems are preventable but maintenance gives you the best chance of staying ahead of the game. Saves time and money – When your HVAC system is not working correctly and leading to inefficiency, your monthly utility bills will be much higher. Having a clean, well running system will ensure you won’t have any surprises on your next bill. Avoid inconvenient and costly repairs – The last thing you want is to turn on your air conditioning unit and find out it’s not working. With maintenance, you tackle these issues before they sneak up. 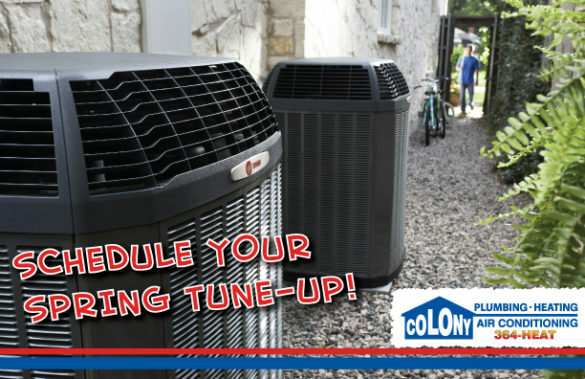 At Colony Plumbing, Heating and Air Conditioning, we believe the Service Maintenance Agreement is the most viable option for the longevity of your HVAC system.